Filled with joy at the finish line of 'The Gobbler' Thanksgiving Day fun run,at Crosby Family Confluence Park, St. George, Utah, Nov. 23, 2017 | Photo courtesy of St. George Gobbler, St. George News. ST. GEORGE — What better way is there to start Thanksgiving Day than to burn some extra calories and benefit the community at the same time? 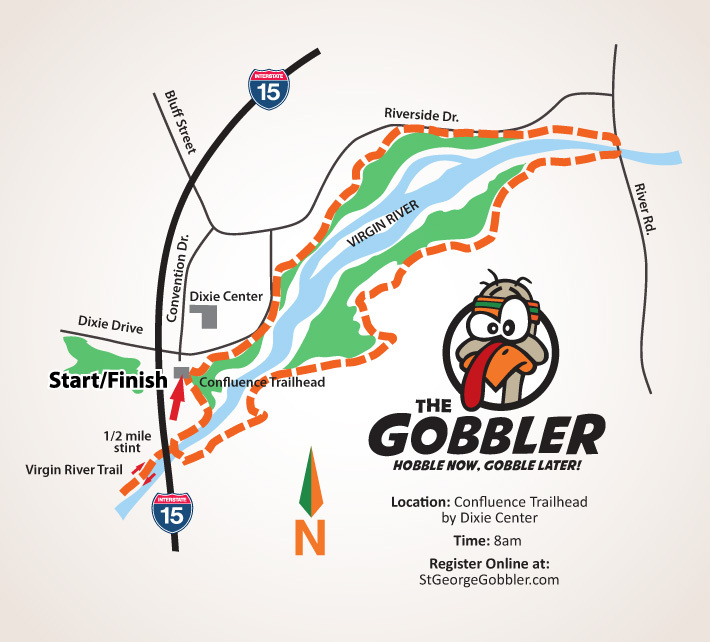 Course map of ‘The Gobbler’ Thanksgiving Day race to begin at the Confluence Trailhead | Image courtesy of The Gobbler Thanksgiving Day Run, St. George News. Registration is now open for 2018’s “The Gobbler,” 10k, 5k, and 1k races, and organizers say the family-friendly event has something for everyone to enjoy. The family tradition began in 2013 when brothers Collins and Adam Stuart wanted to find way to bring loved ones together on Thanksgiving to have a little joy and maybe even make some room before the feasting. What started with only a few people gathering to hit the dirt trails for fun has exploded into one of the most anticipated events of the holiday season. Every year since, the event has benefited the Dove Center of St. George, an organization whose mission is to empower survivors of domestic violence and sexual assault through education and resources. This year, for every $1 donated by participants, race organizers will match $1, and 100 percent of all donations will go to the deserving cause. The gobbling fun begins assembling at 7 a.m. at the Confluence trailhead by the Dixie Center St. George, and the first race for kids starts at 8 a.m so parents will have a chance to watch before the main event. Participants are encouraged to stick around after the race for games, bounce houses, prizes for the kids and a whole lot more. Every person who shows up will also receive two awesome gifts: a secret apparel item that you won’t want to miss out on and a bag full of local retailer items offering Black Friday specials just for the event attendees. Online registration will end Nov. 20, but you can still register in person Nov. 21 at Lin’s Market on Sunset Blvd during the packet pickup day from 11 a.m. to 8 p.m. or on race morning from 7-7:45 a.m. All racers, including the kids will receive an official race day shirt, and the secret gift is something everyone wants to collect each year. Thanksgiving remains the most popular race day of the entire year across the nation – must be something about all the eating – so come join the fun tradition and discover why The Gobbler is the perfect way to start off this family holiday. What: The Gobbler 10K, 5K and 1K. When: Thursday, Nov. 22, 7 a.m. Cost: 10K: $28; 5K: $25; 1K: $13. Details: Online registration ends Tuesday, Nov. 20. Late registration will be accepted Wednesday during packet pickup at Lin’s Marketplace on Sunset Boulevard in St. George from 11 a.m. to 8 p.m. . Thanksgiving morning registration at the race will be accepted but with a $5 per person surcharge. Late registration payments by check or cash only. If you need to arrange a day for packet pickup, please email your request.